The Saddle Brook Police Department is issuing this ALERT to remind citizens, especially senior citizens, of a HOME DIVERSION-TYPE BURGLARY. In a HOME DIVERSION-TYPE BURGLARY, someone comes to your home, rings the doorbell and pretends to be a utility worker, such as Public Service Electric & Gas or a County or Township Water or Public Works Department. They provide a false statement such as there is a gas leak or water emergency in the area and need to check the gas or water line in the home. Sometimes they may be wearing or present a false and phony identification card. There have been times that residents have allowed the phony con artist into their home. 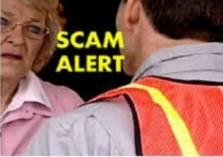 While accompanying the person within the home and often checking the pipes or areas including the basement with the imposter, 2 or more persons involved in the scam enter the home and unknown to the resident. Once inside the home, they enter bedrooms and steal whatever of value they see in sight, often including money, jewelry and precious heirlooms. Then they all quickly leave the home before the resident comes to learn of their valuables taken. A similar type HOME DIVERSION-TYPE BURGLARY occurred in Saddle Brook on Friday, January 17, 2014 on Floral Lane near Midland Avenue. In this incident, a male person rang the doorbell and pretended to be from Public Service Electric & Gas Company and had shown the elderly resident a phony identification. The male person told the resident there was a gas leak in the area and needed to check the pipes in the home. As the resident allowed the male to enter the home and followed the person to the kitchen area, 2 other male persons entered the home and went to the bedrooms. The males went through the bedroom and stole an undisclosed amount of cash and/or valuables. SHOULD ANYONE RING YOUR DOORBELL AND SAY THEY NEED TO CHECK YOUR GAS, WATER OR OTHER UTILITY SERVICE, DO NOT LET THEM IN, CALL POLICE IMMEDIATELY.